The apple of his mother Mallory Golladay's eye, "Kabbie" is yet another of the "BS x Alibi" children to excel in the show and now agility rings. Kabbie finished his title with two specialty wins; first at the Greater Milwaukee Norwegian Elkhound Association Specialty from the Puppy class with an Award of Merit and again at the same show under master-breeder, Lana Hall ("Rikkana"). He delights all with his silly antics and is more commonly known as "Snackboy" for a number of reasons! Now a veteran, he has started on his Agility career and holds the titles NA, VNE, CGC and TDI thusfar-- watch for more! At an age of just two weeks short of his 11th birthday, "Kabbie" finished his AKC Companion Dog title (CD) with excellent scores! Old dog, lots of new tricks!! With his Therapy Dog title in paw, Kabbie heads off each Thursday to the Fairview Ridges Hospital in Burnsville, Minnesota to lend his own kind of healing to patients in need there. Check out his ID card in his photo gallery... too cute! 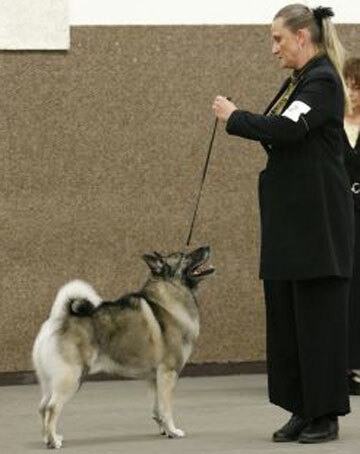 Moving on to the Chicago area in later years, he played the role of elder statesman making an appearance now and then at various Elkhound specialty shows. We doubt that there could have been a more loved individual.